With Prospects having to postpone their trip to Brechin, there were four teams from St Andrews Table Tennis Club on league business this week. In Division One, Prefects’ hopes of making up ground on near rivals Kings suffered a setback with the non-availability of Clyde Johnson and Peter Bladen. Alain Leger manfully stepped into the breech but neither he nor Howard Lee could back up Michael Hahn’s fine hat-trick of singles victories. Howard could feel aggrieved though at not putting a point on the scorecard when he fought back from two sets down against Plamen Kostadinov, only to be pipped 9-11 in the decider. Prefects may yet have to rely on league reconstruction saving them from relegation to Division Two. Sascha Roschy also played a couple of close five-setters in the Truants match against Viscounts at Ward Road Gym, but he emerged with his 100% record intact. Graham Wood added another two wins and they combined to take the doubles for a 6-4 victory which consolidates their fourth place in Division Two. To assist with player availability, New Kids switched their Division Two home tie against Lundin to the Lasers’ venue but perhaps emerged from the fixture regretting this decision. On a night when they just couldn’t get firing in the squash courts, Ian Smith and Ken Falconer only managed one win each for an 8-2 defeat. 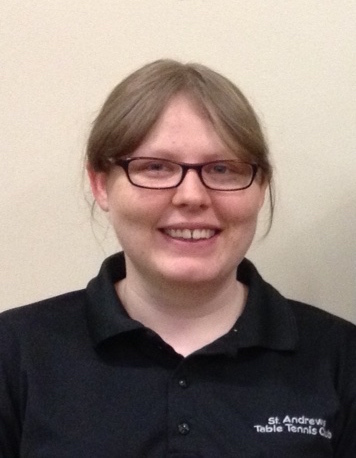 Emma Bissett’s win over in-form Stephen Caird was a highlight in an otherwise disappointing Swots defeat to Kingsway. Similarly, Swots did not find the carpeted conditions of Kingsway’s home patch to their liking. In the clash of bottom against third bottom. It was a strange evening, with no one player dominating. Dave Beveridge got Swots off to a good start with a win against Alan Carrie, coming back from 0-2 down to win 15-13 in a cliff-hanger fifth game. Collin Bleak was best for Swots with two wins and Emma Bissett was the first player to beat Stephen Caird for a few weeks. However, that only gave Swots a total of four points, which was far from ideal against the lower placed team. Let’s hope Swots and New Kids are saving their best for the latter stages of the season, otherwise the club could be looking at both teams being relegated from Division Two. This entry was posted in Match reports, St Andrews Table Tennis Club on January 29, 2017 by standrewstt. With Prospects having a free week and Prefects’ fixture postponed, there were only three St Andrews table tennis teams in league action last week. On Monday, the much anticipated Division 2 relegation derby between Swots and New Kids kicked off the week. It might have given either team a desperately needed advantage over the other but a long, tough battle saw the points shared five a piece with six of the ten matches requiring five games to decide. New Kids started best with Kong Wan edging out Dave Beveridge 3-2 before Collin Bleak levelled with a 3-1 win over Ken Falconer. Ian Smith put New Kids in front again with a 3-2 win over Emma Bissett, only for Collin to level things yet again with a 3-2 win over Kong. The Kids took the next three matches, including a tight doubles match (3-2 of course). With Swots facing a heavy defeat they produced their best form of the night when Collin and Emma beat Kong and Ian in straight games. The final match between Dave and Ken looked like securing the win for the Kids when Ken went 2-0 ahead with relative ease. However, a perceptible change of tactics in favour of a defensive war of attrition led to lengthy rallies, often exceeding 60 shots. Dave’s switch to a more conservative approach gave him the edge as he won the next three games to secure a draw that Swots had seemed highly unlikely to earn forty minutes earlier. Collin was the hat-trick hero of the evening, achieving his treble in front of two members of his fan club who were watching the action from the balcony. They agreed that the fixture was their social highlight of the year so far. Tuesday saw Truants at home to fellow Division 2 ‘middle-tablers’ Tigers. 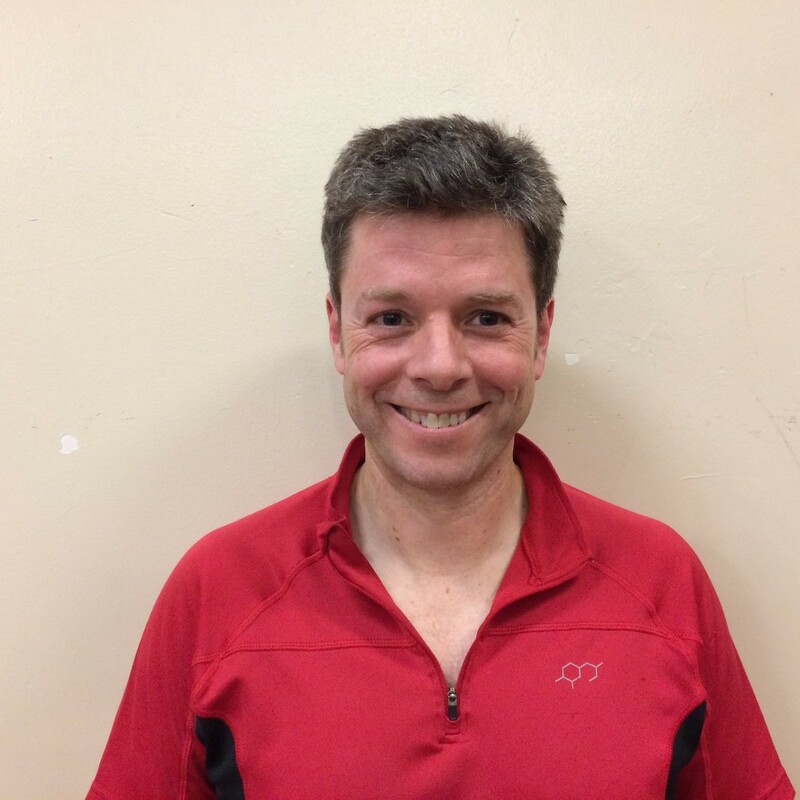 Truants’ Alain Leger lost a tight first match 3-2 to Paul Jackson, but our Gauldry based team then reeled off eight straights wins, including fine hat-tricks for Sascha Roschy and Graham Wood, with the latter avenging Alain’s defeat with a 3-2 win over Paul. Tigers took the last match to make the final score a more respectable 8-2 for Truants. It’s an understatement to say that Sascha is proving to be the find of the season, having won all 21 of his matches since joining the club mid-way through the first half. The German secured a place in the DDTTA interleague squad this week and could yet walk off with the District’s award for the highest league average across all three Divisions. Watch this space. This entry was posted in Match reports, St Andrews Table Tennis Club on January 23, 2017 by standrewstt. 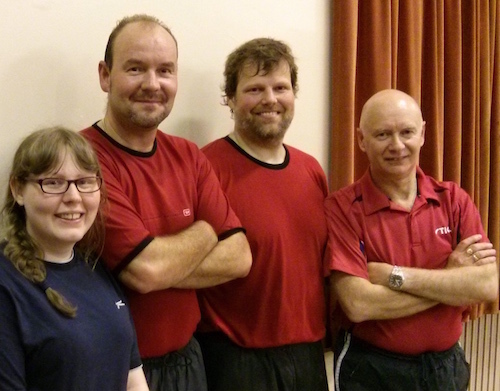 With Rob Brown (second from left) nursing an injury, it was left to Emma, Collin and Dave to see off Aces in the handicap cup. 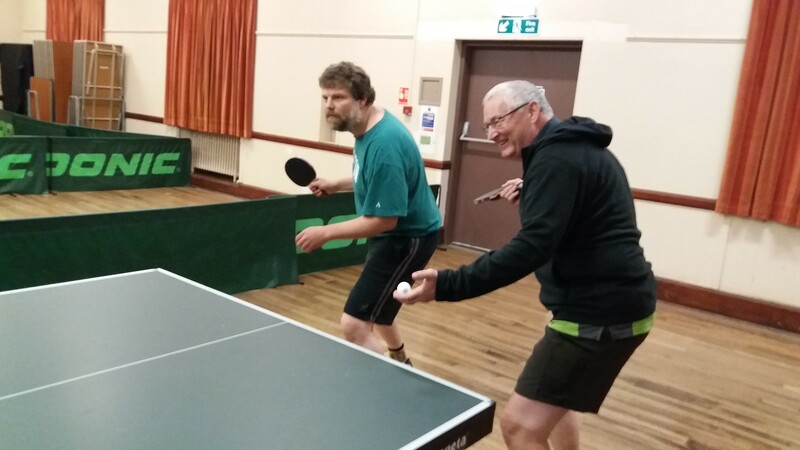 It was Handicap Cup week in the Dundee & District Table Tennis League and Swots were one of the teams who enjoyed having a break from the strain of relegation worries. The St Andrews side played hosts to Forthill’s Aces and, while they benefitted from the handicapping system which gave them a start in each encounter, the Swots trio committed themselves to attacking tactics which didn’t allow their Division One opponents to settle. Collin Bleak was in particularly good form, winning six out of six, but Emma Bissett and Dave Beveridge also turned in three wins from four to give a 12-2 scoreline. Swots now join clubmates Prefects in round two, the latter having enjoyed a first round bye. Brechin made the long journey to take on New Kids on the same evening in the Victory Memorial Hall. This was a tricky one for the handicapping committee as the home side are second bottom of Division Two while Brechin are riding high in Division Three – and in retrospect the officials underestimated the form shown by the Angus side. Only Kong Wan managed two wins for the Kids, with Ian Brumwell and Ken Falconer not able to make any inroads. Prospects’ captain Jon Fraser was also left cursing the handicappers at Telephone House on Thursday evening. Team mates Emily Howat and Neil Lea revelled in the starting scorelines and put eight wins on the board between them against Telsports, but Jon had been given too big a hole to climb out of and the St Andrews side lost out 8-10. Back to league business this week, when the focus will be on the derby between Swots and New Kids, which will have a huge bearing on the end of season final positions at the bottom of Division Two. This entry was posted in St Andrews Table Tennis Club on January 15, 2017 by standrewstt. Mid-Season Report: Could (must) do better! In Division One of the Dundee & District League Prefects are sitting seventh of ten teams but have the comfort of knowing that there is unlikely to be any relegation due to the division not having its full quota of teams. However, the team’s trio of Clyde Johnson, Howard Lee and Peter Bladen will be looking to back up their star man, Michael Hahn, to try to put some distance between themselves and their closest rivals, Rockets and Kings, with the target of finishing in sixth place. Availability of players is a problem at times for captain Howard, but if Michael is available on a regular basis to build on his thirteen wins from fifteen starts, then moving a place higher is a real possibility. Sandy Pearson (right) demonstrates how to serve from the wrong side of the table in doubles. Sandy will be missing for Prospects in the second half of the season, while Swots’ Collin Bleak (left) will be hoping that work commitments will not make him miss so much play as in the first half. Division Two team, Truants, is the highest placed of all our teams at the halfway stage. Graham Wood has turned in his usual solid performances, with thirteen wins from eighteen matches, and Alain Leger must be delighted to be sitting with an average of 53% after several seasons away from league play. However, the main reason Truants sit in fifth spot has been the arrival of Sascha Roschy who is unbeaten in eighteen starts. At the other end of the table, New Kids and Swots find themselves second and third-bottom respectively and it will take a big turnaround in form if one or the other is to avoid relegation. Both teams are well adrift from fourth bottom Lundin Lasers who have enjoyed an excellent run in their first season at this level. The Swots v New Kids derby clash in the third week of January will have a big say in deciding who will accompany current relegation favourites Kingsway in the drop. Unusually, four of the Prospects team are sitting on the same 67% average in Division Three. However, Sandy Pearson sets off soon on his world travels so that captain, Jon Fraser, will need to lean more heavily on Dave Goddard, Fabio Sani, Emily Howat and Neil Lea to lift the team above their current eighth position. At the moment, only two points separate four teams in the bottom half of the division so a good run of results could take Prospects into the top half of the table. Whatever the fate of the five teams in 2017, rest assured that all the players will give it their best shot in their usual sporting fashion – which makes the Victory Memorial Hall a cheery and vibrant place to spend winter Monday evenings. This entry was posted in St Andrews Table Tennis Club on January 5, 2017 by standrewstt.